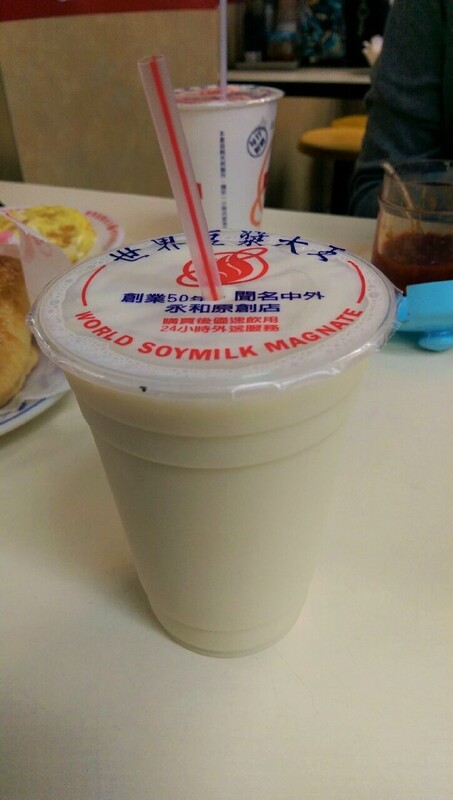 Lot of places claim that they are the king of soy milk/soy milk king 豆漿大王, claim that they are from YongHe (the jury is out on whether they are or not) and most of them are completely average. For my money, this is certainly one of the better ones, and it is in YongHe. It’s in an ideal location being <10min walk away from DingXi MRT station and is very reasonably priced. 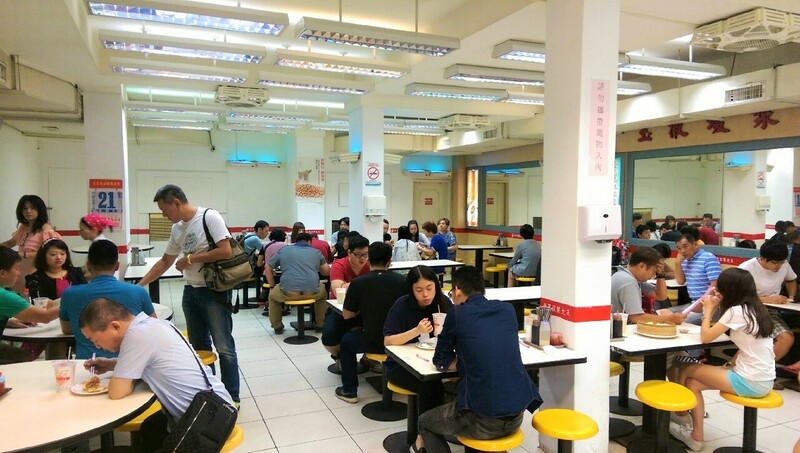 Inside the restaurant, there is always an abundance of people, yet the atmosphere never gets too energetic. The kitchen staff are very competent, efficient, friendly and fun. 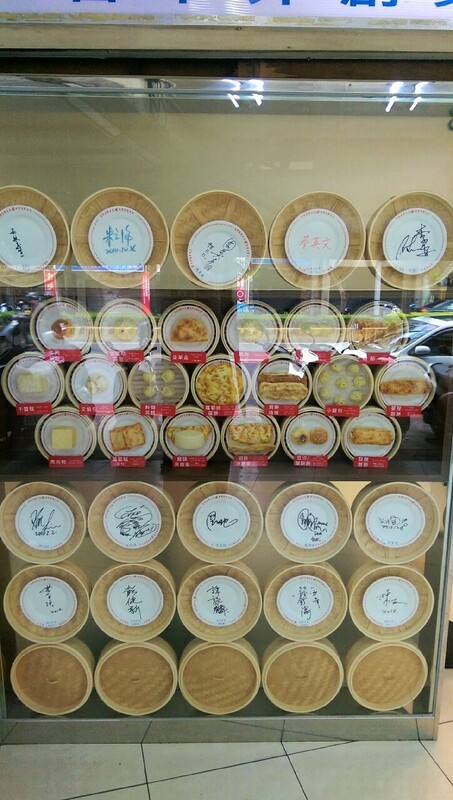 They don’t speak English, but it really doesn’t matter because they’re quite happy to offer things up for you to try! There are plenty of tables inside, but sometimes it does get so busy that you may have to wait if there is more than 4 of you on the weekend (no more than 10mins). 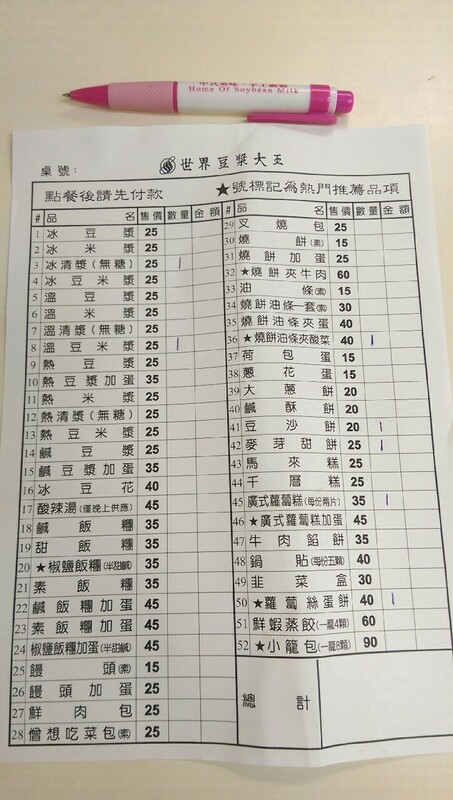 The menu is quite vast, but I have been here quite regularly, so I feel that I’m in a good position to be able to recommend some things in addition to what we ordered. 1. 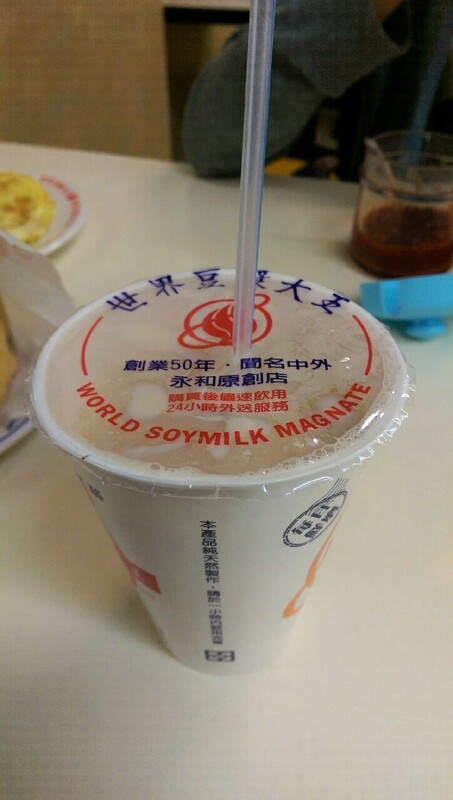 冰清將 （無糖）bing1qing1jiang1 (wu2tang2) Cold soy milk (no sugar). 2. 溫豆米漿 wen1dou4mi3jiang1 Warm soy and rice milk mix. 3. 燒餅油條來酸菜 shao1bing3you2tiao2lai2suan1cai4 fried dough stick, wrapped in a sesame seed pastry, topped with pickled vegetables and peanut sugar. A medium sized steamed bun with a sweet Cantonese pork filling. You get 4 steamed dumplings as it arrives in a bamboo steamer at your table. Rice, rolled out in a sausage shape and filled with a salted radish and pork floss filling. This is presented in a bowl, not a cup. 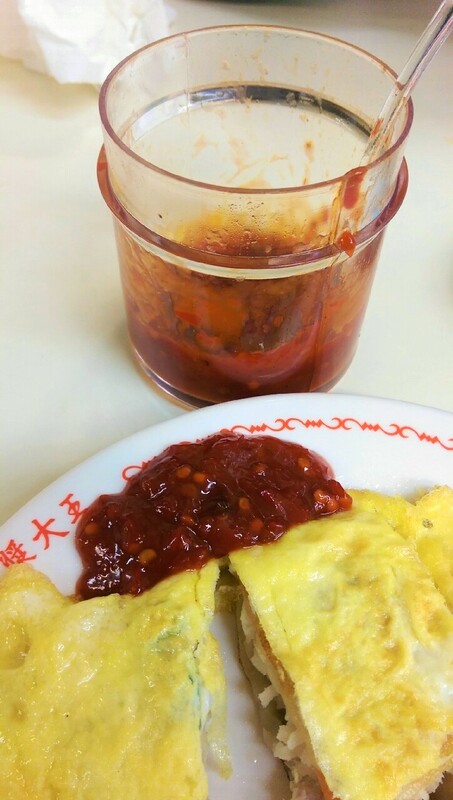 It is served hot, and has a savoury taste with an added egg. Without sugar is how I take my soy milk. It keeps it fresh and healthy. Without sugar it has an earthy, slightly burnt lush green taste to it, with a milky smooth finish. Cold, it is very refreshing and just what you want in those sunny days. Hot, and it’s just what you want in the winter. When heated it gets a little thicker but still maintains all of those fresh and pure flavours that I’ve come to love in this wonderful drink. Unsweetened soy milk is quite a unique taste, so if you don’t like it I would suggest getting it mixed with the rice milk instead of just with sugar. The addition of the brown rice milks makes the consistency a lot thicker, and feels almost medicinal when hot. However, when cold it can still be quite refreshing and also quite sweet. 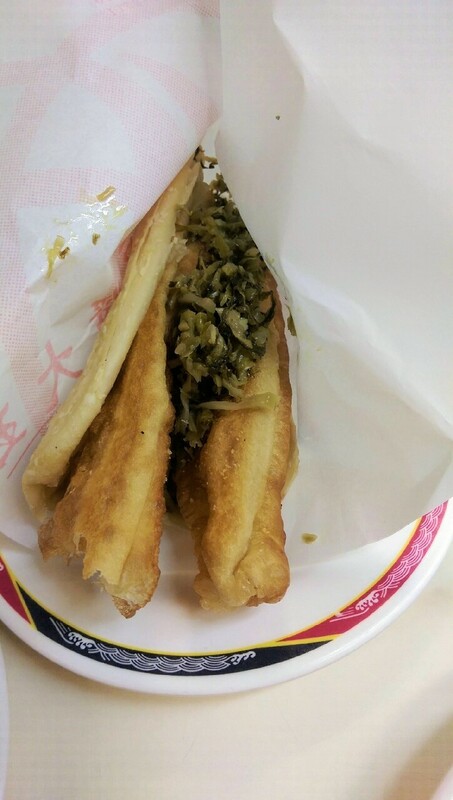 Anyone accustomed to the fried dough stick 油條 will be aware that it can be very greasy. 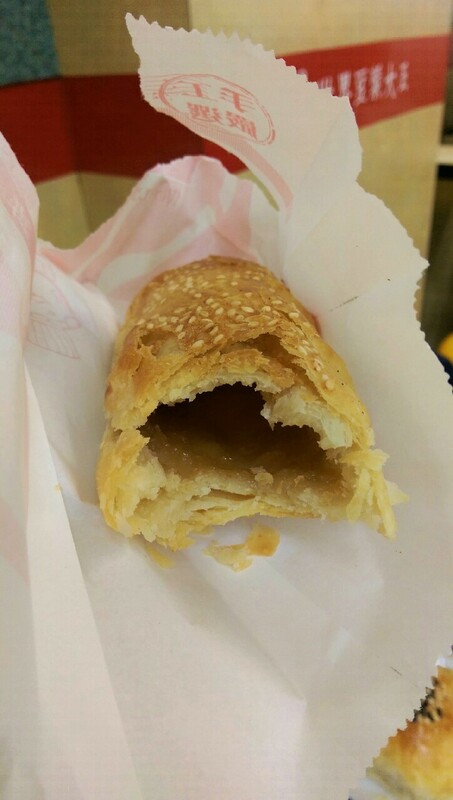 However, sandwiched between the sesame pastry 燒餅, it feels a lot less greasy. However, just the pastry and dough stick sandwich isn’t enough. You need some pickled vegetables and peanut sugar to really add that extra edge that’s required. Just like doughnuts or Churros; fried dough and sugar go famously together. The peanut powder mixed into the sugar gives an extra kick of taste and weirdly complements the pickled vegetable. 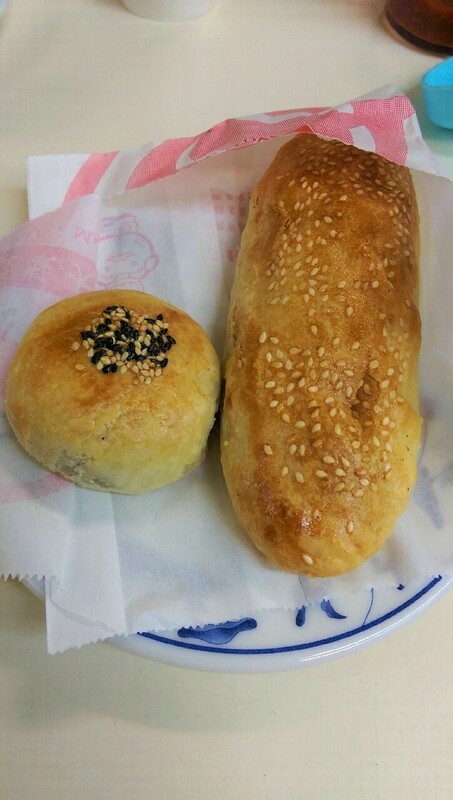 On the left we have the sweetened red bean pastry, on the right is the malted sugar pastry. A tasty little delight. Red bean is something that is very popular in Taiwanese, Chinese and Japanese cooking. Be it in ice cream, doughnuts or like this. This red bean pastry is sweetened and works tremendously well with the salty pastry and sprinkles of sesame seeds on top. It’s less than 4 bites, but is incredibly moreish. Around 15cm in length, this malted sugar pastry is quite different to other pastries I have had before. It puffs up quite a lot, and the centre has a smooth layer of malted sugar. Just as the sweetened red bean uses the pastry to counteract the sweetness, the malted sugar does the same here. If the pastry is hot to the touch, I recommend leaving it a few minutes to cool down. As the sugar is as hot as the sun! (I learnt the hard way, several times) It’s a perfect afternoon snack with a cup of your favourite hot beverage (I recommend tea, but then, of course I would – I am English). 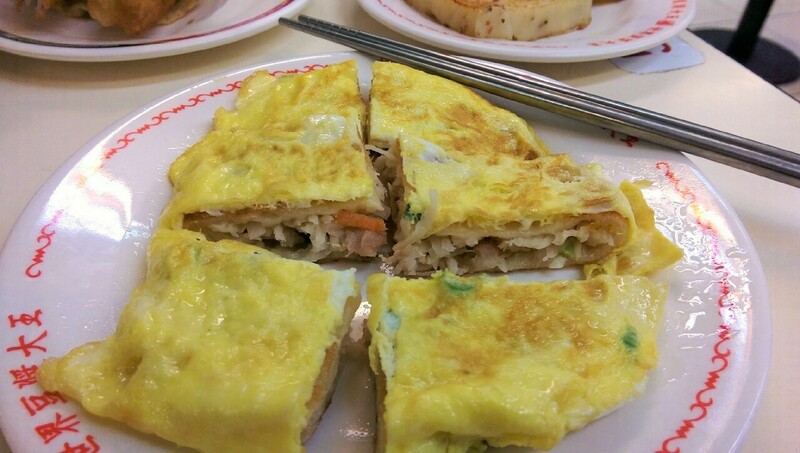 This is a firm staple among the Taiwanese for breakfast. 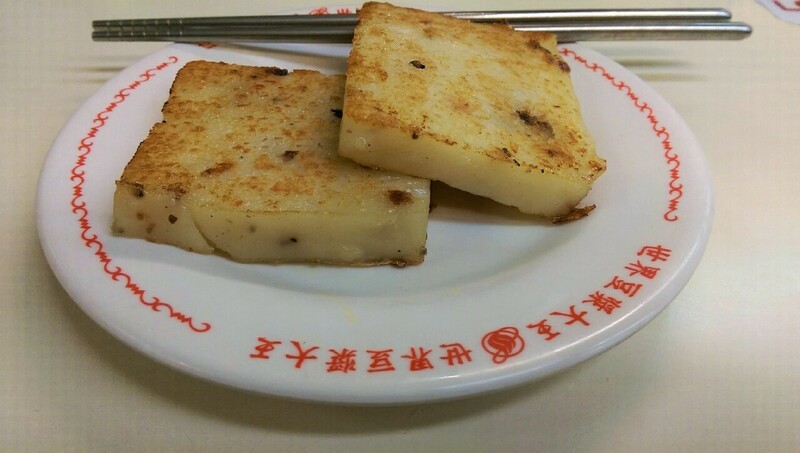 Using Daikon radish and rice flour, it becomes cake-like in its consistency and is fried on top of the hot plate. Frying the radish cake allows the outside to become crispy, yet the inside remains soft and floury. Inside there are flecks of bacon and also small chunks of radish. Even though it isn’t strong in taste, it is still quite enjoyable to eat. Unlike the radish cake of number 6, this one is finely sliced radish mixed with finely sliced carrot and served inside a flattened 餅 (餅 translates to cake, but it isn’t a cake in the western terms of a cake, it is more like a flat hollowed out bread bun) and topped with egg. The slices of carrot and radish are simple but delicious, and the 餅 allows for a contrast in texture, with the egg on top adding richness and lifting the dish altogether. A large dollop of their home-made chilli sauce, and you’re really off to a winner here! I love this restaurant and I come back again and again without hesitation. I always order number 1, 4 and 8. 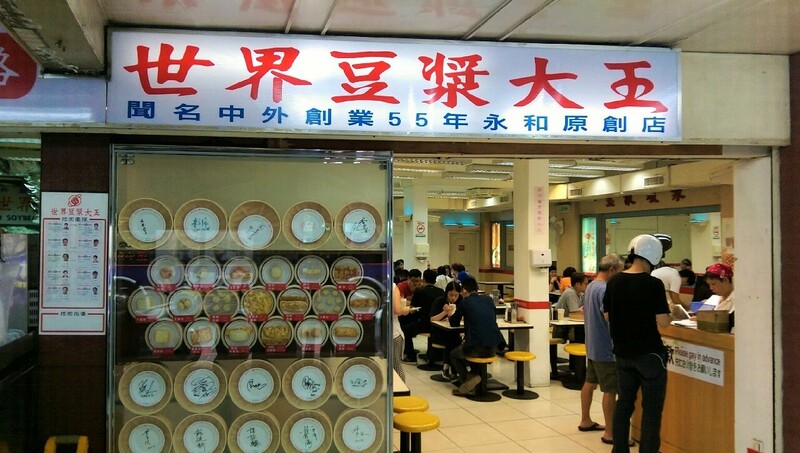 The price is right, the service is very fast and the quality of the food is good. Eating from the small breakfast shops is good for that on-the-go breakfast, but if you’re driving past this place I would strongly recommend you to pop in. If not, I would suggest coming on the weekend. It is 24hours, afterall! Best dish: 7. 蘿蔔絲蛋餅 luo2bosi1dan4bing3 Thinly sliced radish cake with egg – I know it’s called World Soy Milk King, but this dish is just awesome. If I am in England, this is the breakfast I miss. Recently I was away for a few weeks, my first breakfast when I came back was this. I just couldn’t wait! Dish I won’t order again: 6. 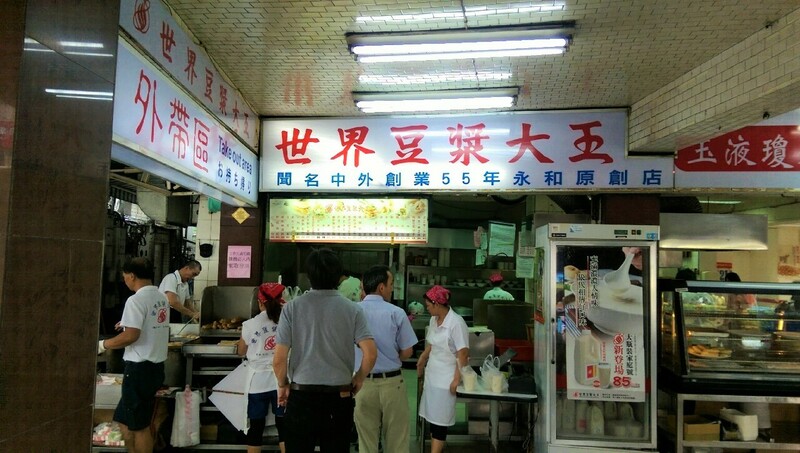 廣式蘿蔔糕 guang3shi4luo2bogao1 Radish cake – Served steaming hot, this is a good dish. However, this one arrived warm only. It isn’t a strong taste anyway, but this one had almost no taste at all. I wouldn’t recommend it when there are so many nicer things to eat on this menu!